Home Society Human Rights The ongoing war on journalists, cont. The ongoing war on journalists, cont. 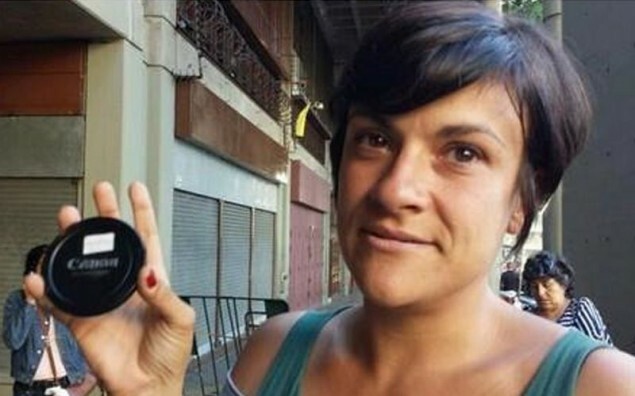 Italian photographer Francesca Commissari, holding the only part of her camera returned by the authorities. On the night of February 28th, the National Guard detained 41 people in Altamira Square (eastern Caracas) during one of their recent repressive raids. According to state media outlets like Telesur, eight alleged foreign nationals were arrested as “terrorist vandalists”. A day and half later, all those detained were released by a court of law. One of them was Italian photographer Francesca Commissari, who has been in Venezuela since 2008, and who is currently working with newspaper El Nacional. At first Commissari was even in danger of being deported, but the court eventually freed her without charges. However, her camera equipment (except the lens cover seen on the picture) is missing and she’s asking whomever took it to please give it back. In the meantime, she has offered her side of the story in this extended video interview, made by her colleague Alejandro Hernández. But as CC has reported before, the case of Commissari isn’t isolated: both domestic journalists and international correspondents are becoming frequent targets of official repression. The latest case occurred yesterday in Táriba (Tachira State), during the violent actions by both irregular motorcycle gangs and the National Guard. The crew of Spanish public broadcaster TVE was robbed of their equipment by such groups, who also tried to rob the camera of New York Times’ photographer Meredith Kohut. As some were forced to leave the country due to threats while others have faced tough times with the authorities, this offensive against international correspondents feels more and more like another attempt to silence the media. This view is also shared by the head of the Venezuelan Press Workers’ Union (SNTP), Marco Ruiz. But Information Minister Delcy Rodriguez won’t bother with this. She’s too busy bashing that Jared Leto guy. Perhaps she needs some help. Can anybody give her Steven Seagal’s phone number? He could be useful.